Joyful Animals for Kids HD by Roman Nazarkevych is an app that will enhance your children’s learning abilities, whilst at the same time helping them become familiar with identifying the sounds and parts of animals, as well as their environments. The object of the game is to match the parts of the animals correctly, by dragging and dropping each part onto an animal template, until the animal is fully formed. Then your child names the animal and chooses which environment the animal belongs too. There are seven animals to create in each category. The first category is free and the other two categories are available via in-app purchases, however, these extra levels are only under a dollar each. When you drag and drop the parts of the animal onto the template, the animal starts to make sounds. The levels, or animal types, are neatly displayed on an oak tree on the ‘At Lawn’ level. I love the music in this game. When I opened this app I first heard a really cute tune with a kind of Eastern European/Russian type beat to it. Then, it changed to the Wimba Way tune. The introduction screen really tells you at a glance, visually, about what this educational game is all about – having fun making up the parts of animals in an interactive environment that will boost children’s learning abilities. Sounds of nature are in the background as you play. In ‘Preferences’ which you can access from the main screen you can stop the sound. If you choose to stop the sound the colourful bird also closes its eyes. These imaginative animations are present throughout the game. I was surprised that this app has eight different language settings to choose from. To go back to a previous screen you must press on the bird in the top left of the screen. There are three different categories of animals to choose from when you press ‘Play’, the ‘At lawn’ animals, ‘In Africa’ and ‘On the Farm’ play areas. The selection screen has some blinking and winking squirrels to keep you company whilst you choose. The graphics within the game has some really colourful artwork with good use of contrasting colours. For instance, when your child has created the animal, correctly named it and has chosen its environment, the colourful creatures are shown in colour, contrasted by a black and white background. However, when you complete a whole level the screen brightens into full colour everywhere. To encourage skills in accuracy for children, you have to position the missing part of the animal over the correct area with only a bit of give and take, otherwise it will not click into place. You can see when you have the right position, as the animal part graphic will turn from translucent to opaque. The animation has been well put together too, for instance, the owl rocks its head from side to side and the lion blinks, wiggles its ears and sticks out its tongue. When your child clicks on a graphic in answer to a question it wiggles. The parts of the animals transition in from small to full size which I think is a neat touch by the developer. I downloaded the extra 2 levels and it was well worth it. The ‘In Africa’ level has a great completion screen, where by tapping on the trees you can hear the sound of each animal. There are sounds of Africa in the background as you put together lions, giraffes and crocodiles, to name be a few animals. I saw on this level that the developer had made the animal parts spin into place inside the selection boxes, making this level a bit different from the last level, as in the musical trees in the Africa level too which is different to the first level’s completion screen. The ‘On The Farm’ levels had a very nice background picture of a cute farmhouse. There are tree stumps on the completion screen, again with the sound of each animal and colourful musical notes to click upon. This is a great app to help develop children’s learning abilities. The app is free, so you can try out the first level and see if it’s right for you, and the extra two levels only cost under a dollar each, so its well worth it. The artwork is fun and striking and the cute animals will bring a smile to your children’s faces. After all, what child doesn’t love animals? The animation is very good as it is dynamic, with graphics rocking, spinning, expanding and changing in opacity levels. Joyful Animals for Kids is very easy to navigate around and is repayable, as you can reset the game at any time. * At the end of the ‘In Africa’ and ‘On the Farm’ levels there is not the same indication of completion as there is on the ‘At Lawn’ level. 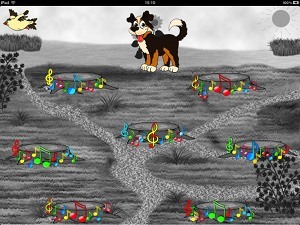 For example, on this first level the colour changes from black and white to full colour on the completion screen. Also, Â you can clearly see which animals you’ve completed and put together as they appear in colour in the oak tree. However, on the other levels there is not the same indication that an animal or level has been fully completed. Small children will perhaps get confused as to which one they’ve completed and which ones they have not. Therefore, I would suggest to the developer that the graphics need to become coloured on the greyed out animals on the in-app purchase levels, and that some indication of the whole level being completed to appear when all animals are made would be good on these extra two levels. * To further boost the appeal of Joyful Animals for Kids HD, it might be a good idea to make more levels, maybe doubling up the in-app purchase levels and giving the odd free level to people who have purchased all levels. It’s not that there isn’t enough levels, as there are more than enough, but people will be even more excited and motivated to download extra levels if they get even more levels than they expected. This is just a suggestion however, the levels would be okay left just the way they are of course. A delightful app, full of cute, magical animals and backgrounds, which will keep your children entertained and also help develop their learning skills at the same time. Even as an adult I must say that I enjoyed putting all the animals together and went through the whole game. 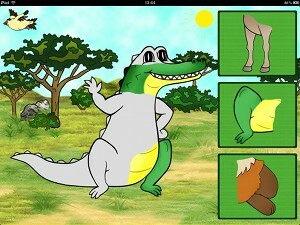 Joyful Animals for Kids HD is a beautiful educational tool and well worth downloading. Don’t forget – the first level is free! You can’t lose anything by trying out this great app.